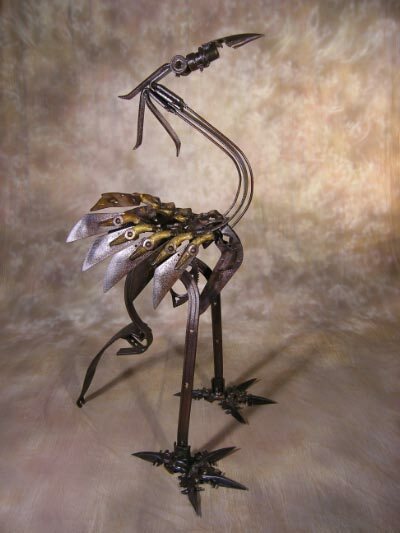 “My sculptures are assembled from steel components acquired from antique agricultural equipment and tools such as planters and cultivators. Most of the steel material used to make my earliest pieces have parts from equipment my family used to grow crops and maintain our farm. Now, I rescue the retired and discarded mechanisms from tractor graveyards and farm auctions. It is a recycling of material that was used to grow food to feed our nation over the past one hundred years, recycling of steel that would otherwise be melted down and sold to the highest bidder.” “I tear the retired implements down bolt by rusty bolt, clean the pieces and sort them by size and type. Inspired and sometimes challenged by the shape of a particular piece I begin by assembling and later welding the steel into a completely unique work. Like pieces in a puzzle, I strive to use the components in my sculptures without changing their original form. I don't tell the metal what shape it needs to be. The shape of the metal tells me what it wants to be. ” Chris Jaworski, a Purdue graduate, entrepreneur and self taught artist grew up on a 157 acre farm in South Bend, Indiana. While earning a B.S. in Horticulture from Purdue University, he suffered the loss of his father and his ancestral farm. After two decades of farming and operating his own nursery and landscape business, he is now devoting time to his art and newly developed sculpture gardens located on eighteen acres of lake front property in Union, Michigan just thirty minutes east of Notre Dame University. Chris exhibits in juried shows and galleries throughout the United States. His sculpture is part of the permanent collection in the Kinsey Institute Gallery at Indiana University. He received the Penrod Society 2009 Mayor’s Award at the Indianapolis Museum of Art. His work has been awarded by the curator of The Chrysler Museum of Art, and an art critic for The New York Times. He received the award for Best Sculpture in 2008 at the 47th Annual Krasl Art Fair in St. Joseph, Michigan and also at the 11th Annual Carmel International Arts Festival in Carmel, Indiana. His work is featured in Direct Art Magazine, Lake Magazine and on ‘Open Studio’, a WNIT television broadcast. In October, 2010 Chris received a purchase award from the Midwest Museum of American Art, Elkhart, Indiana.